Manage all your stl, obj and 3mf files well-arranged in projects with hq rendered preview images, 3d preview and additional data. Find your models easily with rendered preview images. 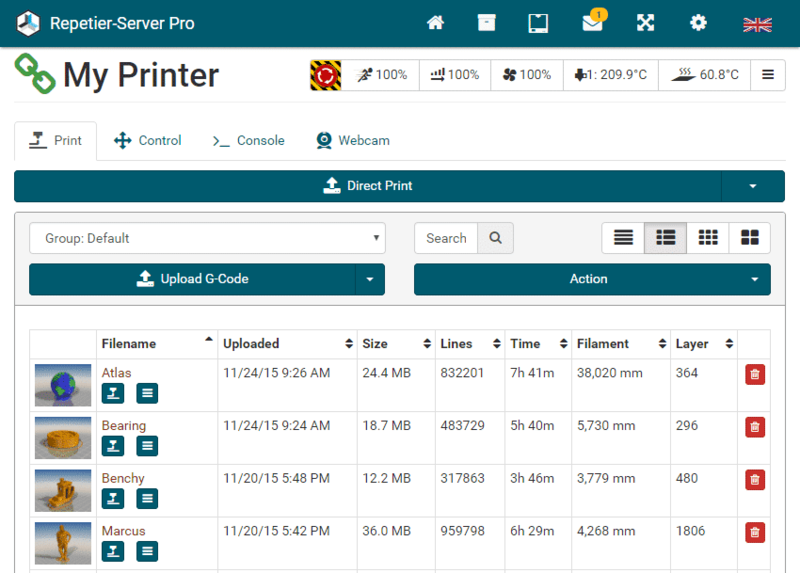 See all activities of your printers on the dashboard. Observe your printer via webcam from anywhere, anytime and make astonishing timelapse videos of your prints. 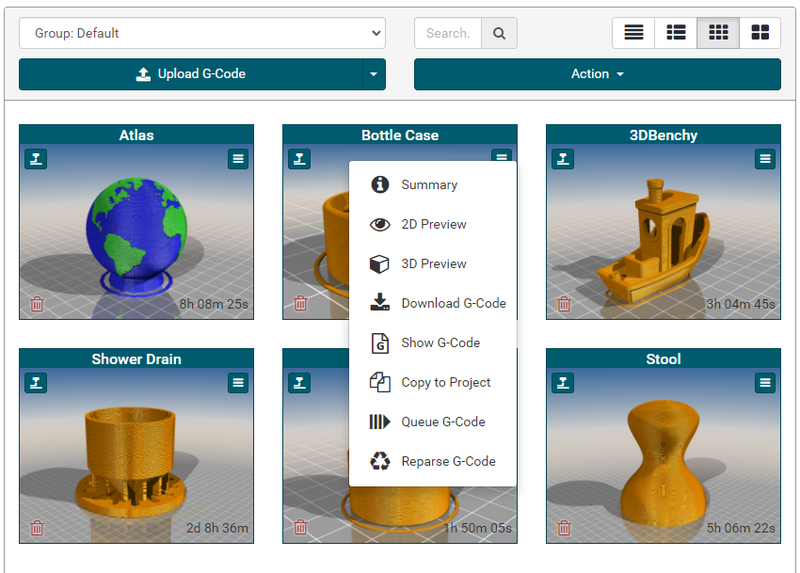 Manage and upload your 3d models and start your printing jobs from everywhere. Control your printer from your smartphone, tablet or pc. Check the g-code and send commands to your printer. Get desired status reports via fast and free push messages to your smartphone and/or tablet with our Repetier-Informer app. 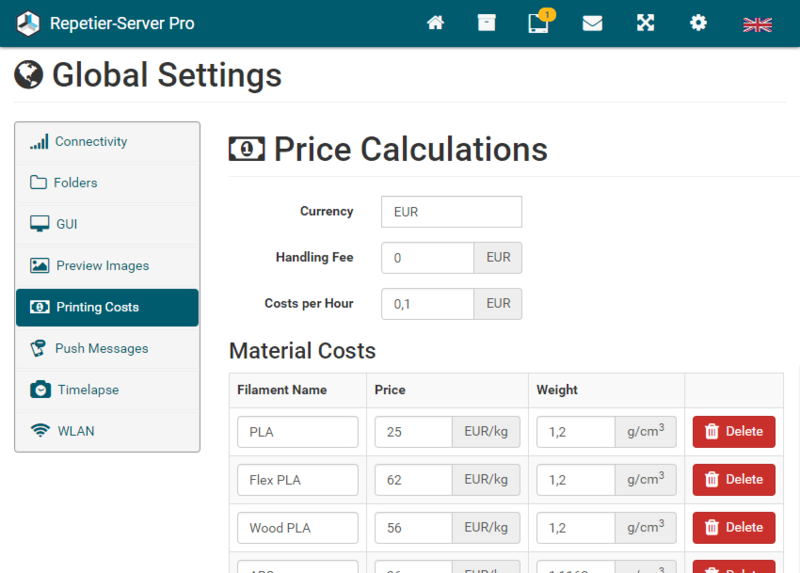 Get price calculations for your models to keep costs under control. 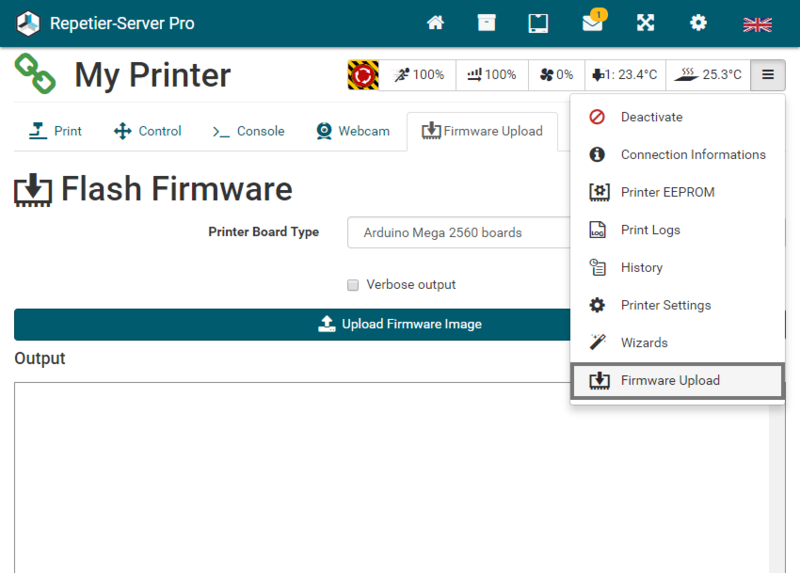 Upload your new printer firmware via Repetier-Server – updating was never easier. New optimized interface for printer mounted touchscreens. 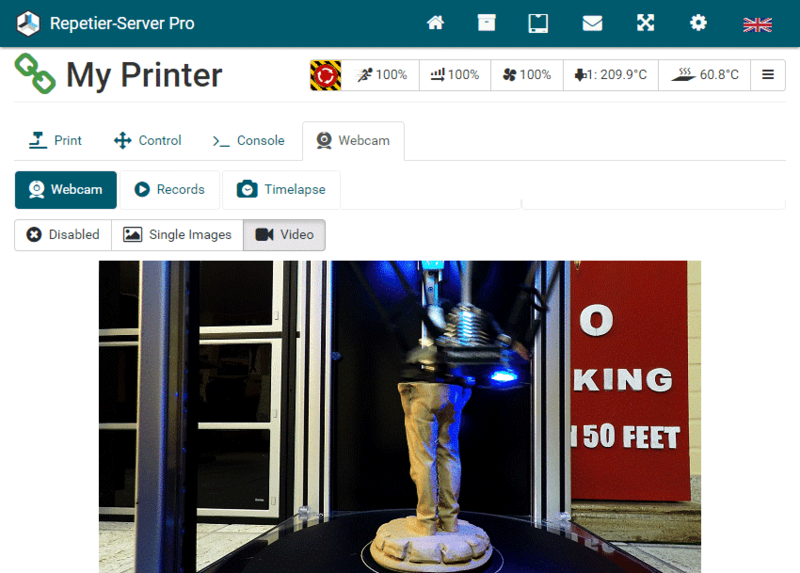 Full Flexibility – Access and control your 3D printers via web interface from everywhere. 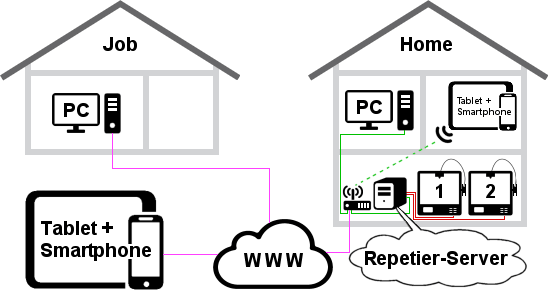 If you want to connect from outside your home network (intranet) you need a vpn tunnel to your network (secure solution) or add port forwarding to make the printer available from the internet. Maximum Compatibility – Works on all recent browsers on computers, smartphones and tablets. Webcam Integrated – Watch your print anytime. Timelapse Videos – Create amazing 3d printing timelapse videos to control your printer and to share. 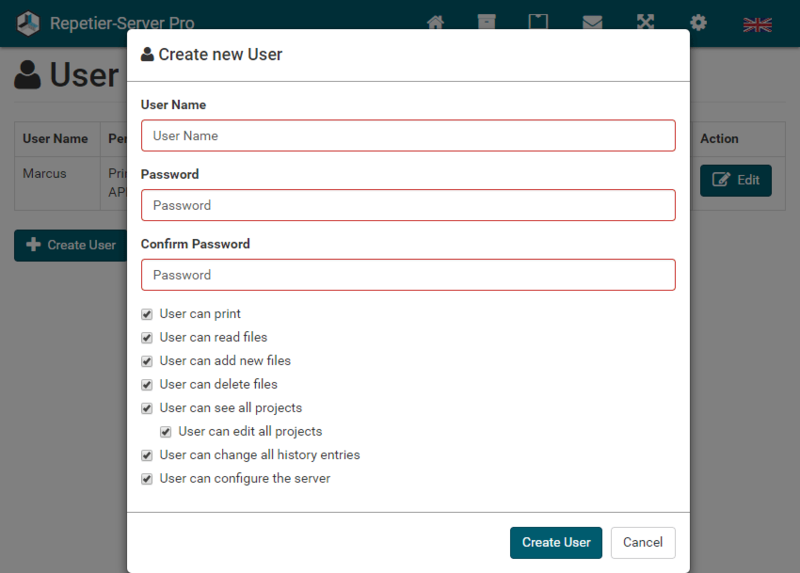 Security through User Authentication – Give each user only the necessities rights, for example print only or allow configuration. Small Memory Requirement – Prints files of any size with new file management. Prints prefetch only the next 5,000 lines. G-Code preview only loads single layers. Price Calculation – You get the production costs before printing. We even split usage by extruder. 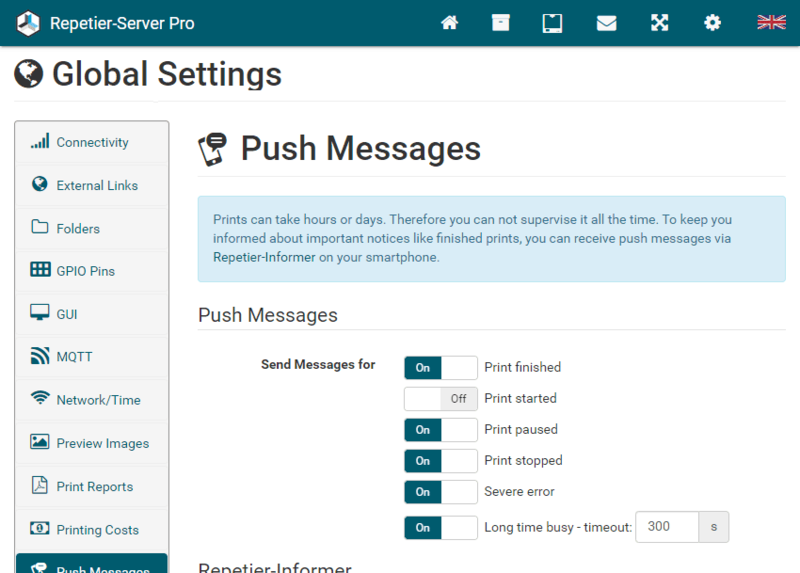 Push Messages – Get free push messages with status reports via Repetier-Informer on your smartphone or tablet. Preview Images – Fully configurable high quality rendered images for all models and g-codes for easy recognition. Model Repository NEW – Manage all your 3d models (stl, obj, 3mf & rmf files) clearly arranged in projects, where you get high quality rendered previw images and a smooth 3d view. In addition, you can specify additional data such as licenses, descriptions, instructions and comments and upload files such as images, videos, pdf, html or txt files. Multi Printer Support – Connects and prints on multiple printers simultaneously. Rescue System – Remembers position of failure, so you can continue print at last position after connection lost or power failure. Heatup and Cooldown Wizard – This feature measures heating and cooling speed needed for accurate printing time prediction. Autoupdating – Just confirm the update and the server does the rest. Firmware Upload – Upload your new printer firmware via Repetier-Server – updating was never easier. Touchscreen Optimization – Optimized white label interface for printer mounted touchscreens. Repetier-Host – You can connect Repetier-Host 1.5 or higher with Repetier-Server and get more functions and possibilities. Slicing – Slice STL, OBJ, AMF and 3DS files via Repetier-Host. Outsource Compute-intensive Work – If you have installed Repetier-Server on multiple comuters, you can outsoure compute-intensive work as image rendering, slicing and creating timelapse videos on faster computers. Runs on Windows, Linux and Mac – Even a cheap Raspberry Pi is fast enough to run Repetier-Server.